From the West Hunter and Jura Glacier. Access to the Jura glacier is via a rough gully beginning at E40 473 159 that climbs left to the glacier. From the West Hunter, traverse on the right hand side of point 2035 and onto the South East Ridge of Moira. 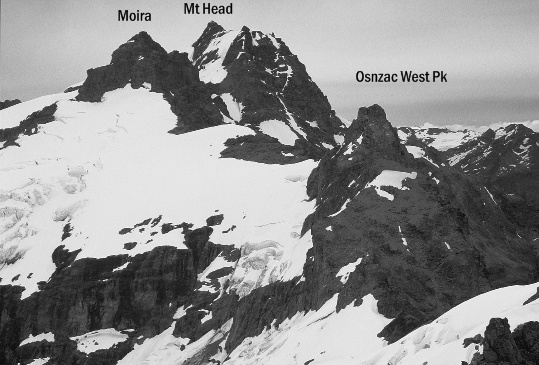 From the ridge, cross the Grant Glacier and gain the col between Moira Peak and Mt Head, and then ascend ridge to summit. A traverse of Mt Head and Moira Peak from the West Hunter bivvy is a great trip to do.